6MC and 6RC Tractors are based on one frame size with 2400-mm (94.4-in.) wheelbase. 6RC Series Tractors offer a closed-center, pressure-and-flow-compensated (PFC) hydraulic system with 80 L/min (21 gpm) of flow to the remotes up to 200 bar (2900 psi) of variable working pressure. If a higher flow is required, a bigger pump with 114 L/min (30.1 gpm) is available in base equipment. With PFC hydraulic system, an extra 12-L (3.2-gal.) oil reservoir is available to increase the oil withdrawal capacity of the hydraulic system. This permanently allows the optimum oil level of all drive components with advantages for durability and efficiency. 6MC Series Tractors feature a John Deere-designed, open-center, constant-flow pressure compensated (PC) hydraulic system with variable pressure up to full pressure of 200 bar (2900 psi). There are two different hydraulic systems available. The PC system offers a gear–type pump and is based on a continuous oil flow. The flow is always at maximum, regardless of the need of the tractor or the implement. The pressure can vary depending on the settings of pressure regulating valves, but the maximum flow is generated by the gear-type pump, which has a direct influence on the engine efficiency. The pressure-and-flow compensated (PFC) system has a consumption–based hydraulic pump, which is a piston pump. When no hydraulic consumers are connected, the pump works in a reduced stand-by flow. 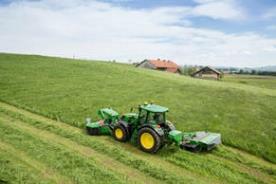 If the tractor or its implement needs more hydraulic power, the pump starts to increase flow or pressure. The oil flow and oil pressure depend on the demand, this makes the pump extremely efficient. This system has a positive influence on the whole efficiency of the tractor because the hydraulic power is only provided when it is needed. The 6MC and 6RC Series Cab Tractors provide room and great visibility, making row-crop and loader work easier while keeping the operator comfortable. 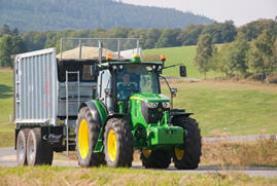 These cab tractors combine form and functionality with easy, uncluttered access to all tractor and implement controls. With low in-cab noise the cab provides a comfortable working environment in all conditions for those long days. 320 degrees of visibility from within the cab ensures accurate tractor placement, implement hookup, and optimal tractor performance. The full frame is designed to withstand heavy load and twisting applications, which allows the transmission and engine to be modular designed instead of being an integral part of the frame. Since the transmission is not used as a structural member, there is greater flexibility in manufacturing processes for integrating options such as a creeper or mechanical front-wheel drive (MFWD). Three large clutch disks provide optimum clutch modulation for smooth operation, and the disks are oil-cooled for a lifetime of service. The PermaClutch 2 is especially suited to tough tractor applications, such as continuous front loader operations or other applications involving a large number of shuttle shifts. The helical cut gears provide large-tooth contact for greater torque-transmitting capability and quieter operation. The pressurized lubrication system delivers cooled and filtered oil under all conditions. A warning light alerts the operator if oil pressure drops, preventing damage to the transmission. All gear shift levers are conveniently located on the right-hand console. Easy-to-use shift pattern allows precise shifting without confusion. 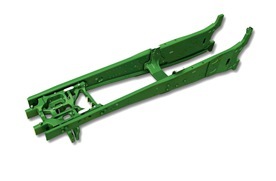 For tractor specific attachment number please view John Deere Configurator. The IPM feature for 6RC Tractors is used for many typical farming operations that use the rear power take-off (PTO) in high-power applications, or when the tractor is used as a transport vehicle. Producers looking for more power in non-stationary PTO and transport applications will take full advantage of this feature. There are specific operating parameters when the Intelligent Power Management system is activated to boost engine power. It is the intelligent part of the system that provides seamless operation while adjusting the engine horsepower, depending on how the tractor is being used. 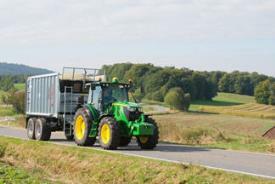 For engine-horsepower boost activation, the tractor must already be running an application that is using the full power capability of the tractor. 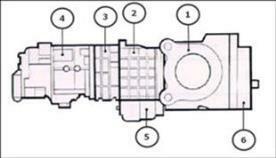 Power must be sensed going through the PTO drive clutch by the tractor electronic systems. The tractor must be moving faster than 1 km/h (0.62 mph). Then gradual stepless performance ramp up starts. At 2,5 km/h (1.6 mph) full IPM power is available. NOTE: If the tractor is equipped with a front PTO, additional Intelligent Power Management power will transfer through the front PTO. However, Intelligent Power Management activation is only sensed through the rear PTO. Adequate load must be sensed on the rear PTO in order to activate Intelligent Power Management. During transport applications with IPM the engine responds seamlessly as load changes, such as when going up and down hills. 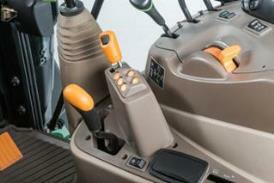 Some operators will run the tractor at full loads and/or run transmissions in auto mode in transport. This means the engine most likely will not be operating at rated rpm. As the engine is loaded, it will eventually drop off of rated rpm and use the power bulge as rpm slows. This is the way every John Deere PowerTech™ Plus engine operates when loaded to maximum power and torque. Intelligent Power Management provides additional engine horsepower from rated engine speed down to approximately 1300 rpm. Horsepower levels are increased above base equipment power bulge values. If the PTO is engaged and the engine rpm stays near the rated speed of 2100 rpm, the full additional power potential for the tractor model will be available for use to handle additional load from the implement or changing terrain. If the PTO is not in use and in transport operation and the rpm has dropped off of rated speed, usable additional power boost of Intelligent Power Management will taper off as rpm decreases. Intelligent Power Management has been thoroughly tested by John Deere engineers to be compatible with the tractor's base equipment with no impact to reliability. John Deere provides Intelligent Power Management as opposed to unapproved aftermarket devices that boost power without regard to engine, transmission, axles, drawbar, or hitch capability. 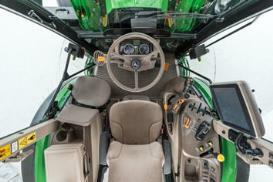 This feature provides optimal utilization of tractor components. For example, with PTO operation, power goes through the axles to move the tractor along the ground and turn the PTO shaft and implement. Adding power to both of these systems does not overload either one individually. At transport speeds, drivetrain torque load decreases significantly from levels seen at low field speeds. Adding power at transport does not overload transmissions or axles. Aftermarket devices are not selective when power increases are available. Great amounts of power increase are promised with these devices. Large power changes are not compatible with the tractor's base equipment. NOTE: The tractor's base equipment changes as power increases. Larger parts, like hitches, drawbars, tire size, drivetrain components, axle diameters, and engine calibrations for emission performance and cooling, ensure durability of the total vehicle as power increases. 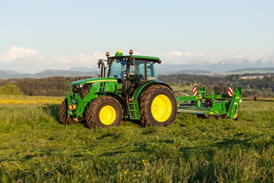 Operating outside of the design capabilities of the tractor's base equipment will have an impact on durability and reliability.